With The Raid star featuring in sci-fi sequel Beyond Skyline, we look at other martial artists who have appeared in the genre. There’s long been a place in Hollywood for skilled fighters and martial arts masters. While many pugilists find a natural home behind-the-scenes as stunt artists and fight choreographers, a few charismatic fighters make it in front of the camera, becoming certified action stars in their own right. One such star is Iko Uwais, who stormed onto screens in 2011’s The Raid. This Indonesian hit broke beyond its national borders to make a serious impact on the international cinema scene thanks to its stripped down story and intense non-stop action sequences. Iko brought his skills in Southeast Asian martial art Silat to the film, earning the praise of both general moviegoers and dedicated fight fans alike. 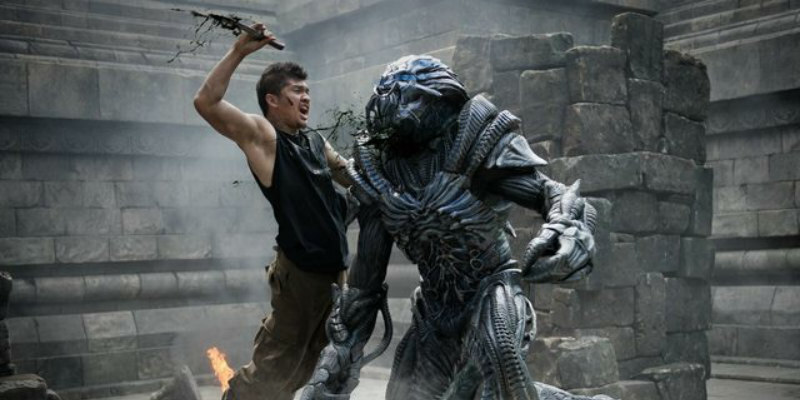 Returning to screens with intense new sci-fi action adventure Beyond Skyline, Iko has traded in the cartels and criminals he usually tackles for vicious aliens as an invasion threatens to take over the earth. The film stars fellow action stalwart Frank Grillo (Captain America: The Winter Soldier) as Los Angeles Detective Mark Corley who, in the aftermath of an alien invasion, leads a band of survivors across war ravaged Los Angeles. As aliens move across the planet, they battle through the bizarre environment, uncovering their horrific secrets. This 1970s sci-fi oddity is notable for several reasons, the chief one being that it’s an unashamed rip-off of the most popular sci-fi fantasy of all time…Star Wars! Arriving not from space but from Japan, the film came courtesy of Toei studios with future Battle Royale director Kinji Fukusaku at the helm and starring renowned martial arts superstar Sonny Chiba. Chiba, a black belt in multiple martial arts including Karate, Ninjutsu, Judo and Kendo, rose to fame after his starring role in 1974’s The Street Fighter before cementing his name in multiple fight films over the next few decades. In Message from Space he plays Hans, the usurped prince of a kingdom now ruled by an evil emperor, who must fight his way back to the throne, aided by a gang of space pilots, aliens and robots. Wesley Snipes, who has training in various martial arts disciplines and holds black belts in both Shotoken Karate and Hapkido, went up against fellow heavyweight action star Sylvester Stallone in this action packed '90s hit. Stallone stars in the film as ‘The 21st Century’s Most Dangerous Cop’ John Spartan, who goes up against Snipes’ ‘Most Ruthless Criminal’ Simon Phoenix. The adversaries are cryogenically frozen in 1996 before being unfrozen in a future where crime has been eliminated. Snipes has a blast in the role of an OTT psychopathic killer in this tongue-in-cheek action vehicle that pokes fun at '90s culture. JCVD had a career in kickboxing and full-contact karate before he left his native country of Belgium to become a Hollywood action star. Bloodsport, his break-out role, was followed by sci-fi effort Cyborg, then later, after becoming a certified action superstar, he would return to the sci-fi genre to go up against fellow '80s tough guy Dolph Lundgren in Universal Soldier. Time Cop was made while Van Damme was at the peak of his box office appeal and remains his most successful film to this day. In the film he plays Max Walker, a cop in a world where time travel has been made possible and enforcement is needed to stop criminals meddling with the time line. After his wife is killed, Walker becomes an agent of the Time Enforcement Commission and becomes embroiled in a plot involving a corrupt politician’s scheme to become president. Screen fighting legend and wushu champion Jet Li left the world of competitive martial arts behind at the age of 19 to take the Chinese film industry by storm. He made his debut in 1982 with Shaolin Temple, and went on to star in such Hong Kong classics as Fist of Legend and the Once Upon a Time in China series. By the late '90s Jet, his reputation firmly established, was beginning to appear in Hollywood films. The original Predator film is an undisputed action classic that sees Arnold Schwarzenegger and a squad of tough-as-nails commandos head into the jungle to battle an alien menace. After a string of dud sequels, culminating in the poorly received Alien Vs. Predator: Requiem, the franchise was in serious need of a reboot. And that’s just what it got courtesy of producer Robert Rodriguez. Predators took the series back to its stripped down, action-heavy roots by depositing a mixed-bag of trained fighters, soldiers and killers on an alien world where they must put aside their differences and learn to work together if they are to survive. Among the crew of undesirables are an American mercenary, an Israeli sniper, a serial killer, a yakuza hit man and Nikolai, a Russian commando. Nikolai is portrayed by Oleg Taktarov, a former mixed martial artist and UFC fighter who specialised in acrobatic takedowns thanks to his samba background. Having enjoyed a lengthy run in WWE, where he picked up the company’s top Championship belts on numerous occasions, Dave Bautista may be best known as a wrestler, but he also flirted with an MMA career. Having studied Brazilian Jiu-jitsu, Bautista used a 2012 break from wrestling to take part in his one and only MMA fight, which he won. He subsequently left the sports world behind to embark on a highly successful movie career, and while he may be best known as humourless green hulk Drax in Guardians of the Galaxy, his first sci-fi film role was in Riddick. In the sci-fi sequel Vin Diesel’s title character has been deserted on a violent alien world where rival mercenary groups, one of which includes Big Dave, are hot on his trail. English martial artist Scott Adkins couldn’t have gotten a better start in the movie business, heading to Hong Kong and working with some of the most celebrated action directors and artists around, including Tsui Hark and Jackie Chan. Since that time he’s gone on to appear in a range of high-intensity action films including The Expendables 2, Wolf Warrior and the Undisputed series. Re-Kill mixes elements of horror and social satire as Adkins plays a soldier tasked with taking out zombies for the government, while his efforts are filmed for a TV show. Former mixed martial artist Gina Carano’s career has gone from strength-to-strength since she left the competitive sport world and moved into film. Her movie breakthrough came when she was chosen by acclaimed director Steven Soderbergh (Ocean’s Eleven, Traffic) to star in his action thriller Haywire. The skilled Muay Thai champ impressed with her athleticism and screen presence, and has moved on to major roles in the likes of Fast & Furious 6 and Deadpool. Carano can next be seen in upcoming sci-fi feature Scorched Earth as a bounty hunter tracking down criminals in a post-apocalyptic earth. Signature Entertainment presents Beyond Skyline on Digital HD 15th December and DVD & Blu-ray 8th January. December 15th includes a US theatrical release from Vertical Entertainment.